Like a bird of prey swooping through the skies on a mission for adventure, the Dainese Raptors Jacket is a streamlined predictor of excellence. In looking ahead to summer riding, the folks at Dainese have put their heads together and gone the extra mile in designing a warm-weather jacket with an aggressive frame. Constructed of Duratex fabric for a rugged exterior, the sanitized lining and air vents on the sleeves and shoulders work to ensure that ample air flows throughout so that you can stay breezy when the thermometer ticks upward. 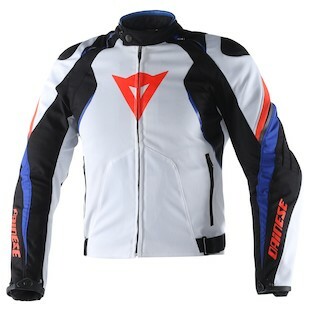 You will also get the signature Dainese external insert that caps the shoulders as well as internal composite protectors at the shoulders and elbows. Additional features include waist, wrist, and neck adjustment, a jacket to pants connection system, and the ability to upgrade into the G1 and G2 back protectors. For the lady riders out there, the Dainese Raptors Women’s Jacket has been specifically designed with a more feminine cut. Lightweight, technical, and incredibly functional, the Dainese G. Raptors Textile Jacket for Men and Women is an aggressive looking, general purpose motorcycle jacket.